Global warming and the intense El Niño now underway are prolonging the longest global coral die-off on record, according to NOAA scientists monitoring and forecasting the loss of corals from disease and heat stress due to record ocean temperatures. 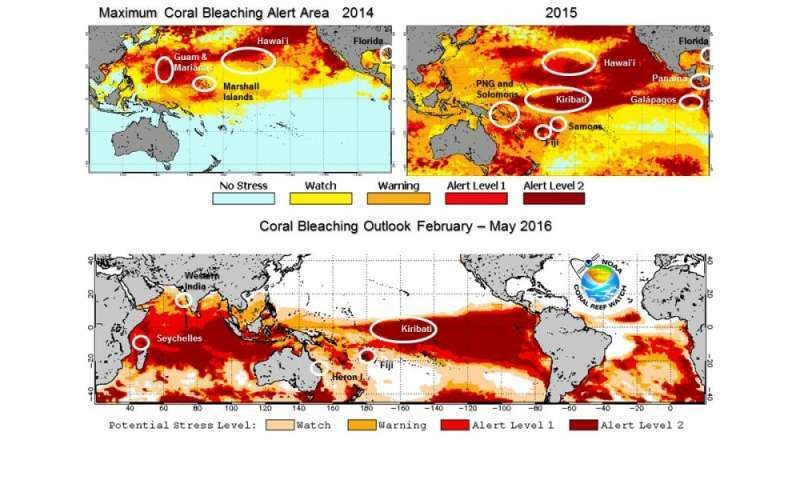 The global coral bleaching event that started in 2014 could extend well into 2017, researchers report at the Oceans Sciences Meeting here this week. More information: The researchers on these studies will present an oral presentation about their work on Friday, 26 February 2016 at the Ocean Sciences Meeting. The meeting is taking place from 21 - 26 February at the Ernest N. Morial Convention Center in New Orleans. Title: A Crucial Time for Reefs: Climate Change, El Niño, and the 2014-16 Global Bleaching Event.